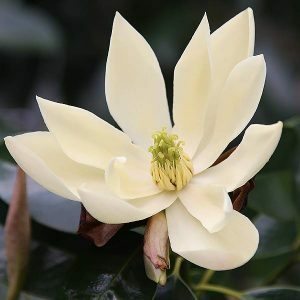 A rare evergreen species from Tibet through to the Guangxi and Yunnan provinces in China, Magnolia nitida has attractive foliage and yellow flowers. 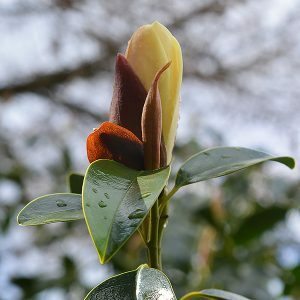 This is a slow growing species however, for those looking for a unique feature plant, Magnolia nitida is worth seeking out. The glossy foliage which is a deep to mid green, with new foliage flushed with bronze to red. The new flower buds are a good buttery yellow, looking very attractive on the plant. The flowers are more creamy yellow to white and appear in spring. Flower colour can vary depending on soil and climate. Flowers are fragrant with a very attractive perfume. Best grown in a sunny yet protected position. A humus rich well drained soil is essential. A slightly acidic soil is ideal, rich with humus. Young plants will need to be watered through the first summers. Mulch around the plant to provide a cool moist root run. Fertilise with a little blood and bone, and top dress with some composted cow manure. Water occasionally with a liquid seaweed fertiliser. Mulch to maintain a cool moist root run, and provide some additional water during dry summer periods.